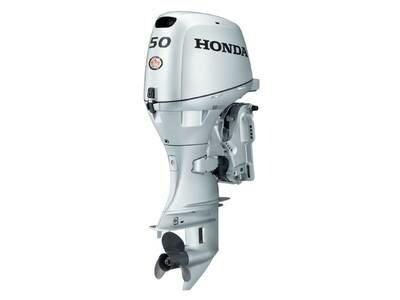 2017 Honda Marine BF50 L Type Proven as both a commercial fishing engine and a recreational outboard, the BF50 is the lightest, most fuel efficient and best charging capacity engine in its class. You get exceptional performance thanks to Boosted Low Speed Torque (BLAST®) and Multi-Port Programmed Fuel Injection (PGM-FI®). Features may include: Honda's Four-Stroke Engine Design World-renowned Honda quality, proven reliability with no oil mixing. Offset Crankshaft Design Locates the powerhead directly over transom bracket pivot point for smoother operation of trim and tilt, as well as reducing stress on the transom and steering effort. Also, it reduces vibration and improves performance and handling. It also provides for a very compact design. Non-Linear Mounting System Patented non-linear mounting provides smoother operation at all engine speeds. Over-Rev Protection Standard rev-limiter protects the engine from severe damage caused by over-revving. Overheat and Low-Oil-Level Warning Systems Standard overheat and low-oil warning systems offer peace of mind and protect your investment. Fresh Water Flushport Allows easy hook-up of a garden hose to flush debris and salt water out of the engine, extending the life of the outboard (optional Flush Kit required). Sacrificial Anodes The BF50 has 1 internal and 2 external sacrificial anodes to protect all metal components from corrosion. Three-Year Warranty The best outboards in the industry are backed by the best warranty in the business, 3 years parts and labour. Light, Compact Design Three-cylinder design allows for smooth operation while remaining compact. Regulated, High-Output Charging System A regulated, 22-amp charging system is standard on both electric-start models to ensure that batteries remain charged while operating electronics. Forward-Mounted Shift Lever (Tiller Models) Allows easier shifting, especially when docking or in tight access areas. Built-in Pitot Tube A Pitot tube is designed into the lower gearcase and allows a direct hook-up for your speedometer. Standard Gauges, Propeller and Control Box Tachometer, trim gauges, aluminum propeller and a high-quality, side-mount control box are included with Power Tilt and Trim models. Sale price does not include freight, pdi and applicable taxes.